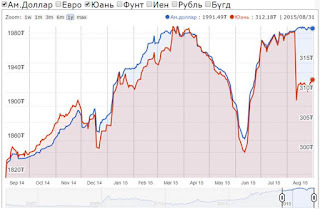 August 30 (Bloomberg) -- Mongolian Mining Corporation sold 1m tons of coal products in Jan.-Jun. compared to 3.2m tons a yr ago, a decline of 69%, company says in statement Friday. * Decrease blamed on "continuing further downward pressure on coking coal price which was caused by oversupply"
August 31 (Proactive Investors) Aspire Mining's (ASX: AKM) Northern Railways has secured financing from its rail and financial adviser Signum Resources Corporation to carry out the first stage of the Bankable Feasibility Study for the Erdenet to Ovoot Railway. Northern Railways' Erdenet-Ovoot railway represents the first stage of a new rail connection linking Mongolia to Russia that provides Aspire with a defined path to market for its Ovoot Coking Coal Project. Northern Railways is the wholly owned rail infrastructure subsidiary of Aspire Mining in charge of the advancement of a multi-user rail line to be constructed between the town of Erdenet through to Aspire's Ovoot Coal Project. The Northern Rail Line will connect the north Mongolian Khuvsgul, Bulgan, and Zavkhan provinces to the existing Trans-Mongolian rail network, which currently ends at Erdenet. Signum will provide a US$600,000 loan and invest US$200,000 through a placement of 13.89 million shares at $0.02. The remaining US$200,000 of the required US$1 million required by China Railway 20 Bureau Group Corporation (CR20G) to complete the first stage of the BFS will be provided by Aspire. This funding will allow CR20G to mobilise and conduct the first stage Feasibility Study fieldwork before the Mongolian winter in order to maintain the development schedule for the Erdenet to Ovoot Railway. Mongolian-based Signum was founded to establish large scale projects in Mongolia and structuring optimal financing solutions and attracting international capital. It will also assist Northern Railways in sourcing the funding for the balance (US$5.5 million) of the Feasibility Study costs and to identify strategic partners and new funding sources for Northern Railways. The recently granted 30 year Rail Concession for the Erdenet to Ovoot Railway provides for an 18 month period to complete a number of condition precedents including the completion of a Bankable Feasibility Study. CR20G is a subsidiary of Fortune 500 company China Railway Construction Corporation (HKG:1186, SHG:601186). The US$600,000 loan by Signum will have a period of the earlier of two years or the date of receipt of further development funding for a minimum of US$15 million to be provided to Northern Railways. Interest payable on the loan, totalling US$100,000, will be capitalised until the facility is repaid. Aspire will also place 13.89 million shares priced at $0.02 each to Signum to raise US$200,000. The 547 kilometre Erdenet-Ovoot rail line represents the first stage of a new rail connection linking Mongolia to Russia that is key to establishment of an Economic Corridor through Mongolia. The total Rail Project construction capital cost is currently estimated at US$1.2 billion. The recently awarded Rail Concession Agreement provides Northern Railways up to 5 years to construct the railway followed by 30 years of operation after which 100% of the base railway infrastructure will be transferred to the Government of Mongolia. Erdenet-Ovoot is key to unlocking the value of the Ovoot Project and future earnings from mining and production from the project for Aspire. Ovoot has a JORC Resource of 255 million tonnes and is the country's second largest coking coal reserve behind the government-owned Tavan Tolgoi project. The open access railway could provide other Mongolian resource projects in the area with a path to market. It could also be used by local agricultural and manufacturing industries and passenger freight, and in time potentially Russian and/or Chinese transit freight. Aspire has entered a new stage in the development of the Erdenet to Ovoot Railway with Signum Resources' funding allowing it to kick of the first stage of the Bankable Feasibility Study. In addition, Signum will also assist Northern Railways in sourcing funding for the rest of the study and identify strategic partners and new funding sources. The company previously advised that the BFS would take about 9 months to complete while the concession enables Northern Railways to progress financing negotiations with Chinese financial institutions with assistance from CR20G. HONG KONG, CHINA--(Marketwired - Aug. 31, 2015) - SouthGobi Resources Ltd. (TSX:SGQ)(HKSE:1878) ("SouthGobi" or the "Company") today announces that Mr. André Deepwell, to pursue other interests, resigned as an independent non-executive director, chairman of the Audit Committee, and member of the Nominating and Corporate Governance committee and Compensation and Benefits committee of the Company effective August 31, 2015. Mr. Lancaster, Interim Chair, said, "Since joining in 2003, André has made outstanding contributions to the Company with his professional expertise and extensive experience. On behalf of SouthGobi, I would like to thank André for his dedication and contributions to the Company and wish him the best in his future endeavours." August 31 -- Reference is made to the announcement (the "Announcement") of National United Resources Holdings Limited (the "Company") dated 8 July 2015 relating to, among other things, the proposed acquisition by the Purchaser of the 70% equity interest in the entire issued share capital of the BVI Co. Capitalised terms used herein shall have the same meanings as defined in the Announcement unless the context herein requires otherwise. As disclosed in the Announcement, a circular (the "Circular") containing, among other things, (i) further details of the Acquisition and (ii) the notice of the GM together with the proxy form will be despatched to the Shareholders on or before 31 August 2015. As additional time is required for finalising the contents of the Circular, the Company expects that the date of despatch of the Circular will be postponed to a date falling on or before 30 September 2015. Shareholders and potential investors of the Company should note that Completion is subject to the fulfillment or waiver of the conditions under the Sale and Purchase Agreement and the Acquisition may or may not proceed to Completion. Shareholders and potential investors of the Company are reminded to exercise caution when dealing in the Shares. The Board wishes to inform the shareholders of the Company that there will be (i) a delay in publication of the announcement of the Interim Results and (ii) suspension of trading. The reason for the delay is that additional time is needed for the Company to finalise certain information to be included in the Interim Results. Ulaanbaatar, August 31 /MONTSAME/ At the Stock Exchange trades on Monday, a total of 1,023 units of 11 JSCs were traded costing MNT three million 249 thousand and 003.00. 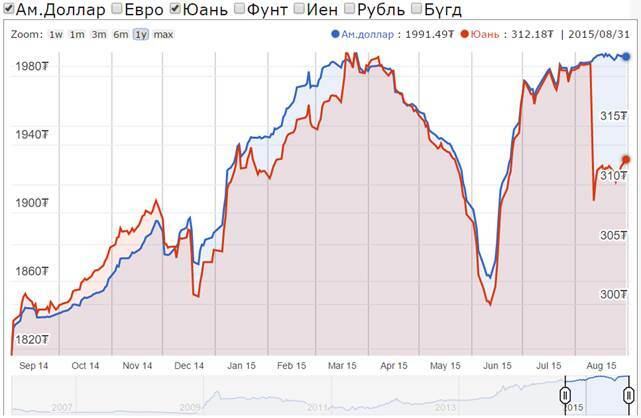 "Hermes center" /212 units/, "APU" /163 units/, "State Department Store" /149 units/, "Mongol savkhi" /140 units/ and "Ulaansan" /76 units/ were the most actively traded in terms of trading volume, in terms of trading value were "APU" (MNT 540 thousand and 300), "Takhi-ko" (MNT 174 thousand and 350), "Mongol savkhi" (MNT 140 thousand), "Gobi" (MNT 88 thousand and 800), and "Ulaansan" (MNT 83 thousand and 600). The total market capitalization was set at MNT one trillion 262 billion 994 million 806 thousand and 097. The Index of Top-20 JSCs was 12,890.12, decreasing 0.54% and the all index of MSE was 950.93, decreasing 0.05% against the previous day. August 31 (MSE) Regarding the "Market Makers" introduction into securities market by Mongolian Stock Exchange /MSE/, MSE will publish two weeks Market Makers performance report to the public. August 31 (MSE) Dear investors, please be advised that the following government bond is about to mature. Ulaanbaatar, August 31 (MONTSAME) According to a report on the 440th trade at the Agricultural Exchange last week, agricultural products costing MNT one trillion and 346 billion were traded. During the trade, 14,402.0 tons of sheep wool was sold with MNT 25.2 billion, 2,215.6 tons of camel wool--MNT 11 billion, 18,938 tons of cashmere--MNT one trillion and 230 billion, 27,447 tons of oil plants--MNT 21.9 billion, 460.3 tons of processed cashmere--MNT 54.9 billion, 43 tons of camel wool--MNT 107.5 million, 1,477.4 tons of processed sheep wool--MNT 1.8 billion, 12 heads of sheep--MNT one million and 1,576 tons of wheat--MNT 872.6 million. As of present, cashmere is sold in nine kinds, camel wool--in eight kinds, sheep wool--in six kinds, oil plants--in two sorts, processed cashmere--in two types, processed camel and sheep wool--in one kind each. Moreover, livestock and wheat for foods are sold in one class each. August 31 (gogo.mn) ADB confirmed its assistance program for Mongolia in 2015 at $290 million, comprising concessional and non-concessional loans, and grants. As agreed with the government, top priority will be given to investments that create jobs, especially those that support small- and medium-sized enterprises and agribusinesses. ADB will also provide support to Mongolian companies to tap export markets, including upgrading sanitary and phytosanitary standards so Mongolian products can freely enter overseas markets without quarantine. In view of the economic slowdown and budgetary pressures, ADB will provide assistance for social welfare to ensure continued delivery of support for the most vulnerable. ADB will also continue its successful program of development of provincial towns, as well as supporting a pilot project to improve school dormitories. The 2015 program also includes ADB's first tourism project in the country, in Khuvsgul aimag, which will act as a pilot for ADB to scale-up. ‎New investments will build on existing assistance, amounting to $698 million, which includes 18 loans, 9 grants, and 30 technical assistance projects. Investments under way include modernization of ger areas in Ulaanbaatar, constructing water and sewerage systems across Mongolia, connecting isolated western Mongolia with neighbors through an international standard highway, improving health services, and skills development to boost job opportunities. In Mongolia, ADB approvals amounted to $218.8 million in 2014, including 4 sovereign loans for $168.5 million, nonsovereign loans totaling $40 million, and 15 technical assistance grants totaling $10.31 million. August 31 (news.mn) Mongolia did not have enough rain during June and July this year, as a result of which the wheat was not able to ripen as normal. This means that the wheat harvest is less than anticipated and will cause an inevitable rise in cereal product costs. Therefore, on 26th August, the State Permanent Special Commission took the decision to import 100,000 tons of wheat from Russia, in order to avoid shortages and price rises. The "Cereal Producing Federation" and Ministry of Food and Agriculture were unable to come to an agreement regarding the problem; therefore the State Permanent Special Commission took the decision regarding Russian imports. What's on Monday's Cabinet Meeting Agenda? 4. "The Result of the Regular Meeting of the Inter-Governmental Commission of Mongolia and Belarus" – by Government Member L.Purevsuren. Under the header - "Other Issues", there is a lot of public speculation because of the necessity to discuss and resolve the appointments of the Deputy Ministers. Last week, the Executive Commission of the Democratic Party (DP) suggested appointing the Chairmen of the DP provincial branches, namely; Khuvsgul, Darkhan-Uul, and Dornod Provinces as a Deputy Ministers. Therefore, it is likely that today the Governmental meeting will discuss this matter. Mongolian Railway to Be Transferred to Erdenes Mongol? August 31 (news.mn) The Prime Minister wishes to transfer the management of the much-troubled State Owned Shareholding Company "Mongolian Railway" (MTZ) to the "Erdenes Mongolia Company". The Government plans to discuss this issue during next week meeting. The "Mongolian Railway Company" has undergone much savage criticism of late, for instance: "They have done no work only create an earth embankment on the future "Tavan-Tolgoi to Gashuun Sukhait line". Recently, many people have begun criticizing MTZ, which is in charge of all the country's railway construction works saying that it is over politicized. Furthermore there are constant delays. It is to be hoped that under the control of the "Erdenes Mongolia" the sector will operate more effectively. August 31 (news.mn) The Media Department of the Parliament Administration has provided information that on 28th August Parliamentary Speaker, Z.Enkhbold issued a protocol (No.173), under which an Honorary and Official Meeting to mark the "25th Anniversary of the Establishment of a Permanent Parliament" will be held. The date for this special meeting of the Mongolian Parliament will be Sunday 13th September 2015, at 11.40 am. August 31 (gogo.mn) Primary court session to discuss the case of L.Gansukh, former advisor to the Prime Minister, is to start on September 2nd at Bayanzurkh, Sukhbaatar and Chingeltei district Criminal Case primary court. L.Gansukh is being accused of money laundering of MNT 3.6 billion while working in Coal Program and the schedule of the trial has been released on August 3rd, but the trial has been postponed with the request to involve the former Prime Minister N.Altankhuyag, Maganement of Baganuur company and analysts from the prosecutor and the attorneys of the accused. Although the primary hearing of the case has been scheduled on August 17th the date has to be postponed once again as the attorneys of the accused had another court to attend. August 31 (gogo.mn) Every new school year President of Mongolia gives lecture for the students on the 1st of September. This year's lecture themed Right mind, Right fate and will be given by the current President Elbegdorj Tsakhia. The lecture will be broadcasted nationwide through Mongolian National Broadcaster at 10 AM tomorrow. Therefore, schools nationwide have been guided to enable every student in Mongolia to view the lecture. Creative Education - Creative Citizen in 2014. Ulaanbaatar, August 31 (MONTSAME) The Prime Minister Ch.Saikhanbileg will take part on Tuesday in an opening ceremony of the 2015-2016 academic years of the city's #33 secondary school in Bayanzurkh district. After the ceremony at the secondary school, the Premier will come to an oath taking ceremony of students to be held on the Square of Chingis Khaan at 11.40 am. Ulaanbaatar, August 31 (MONTSAME) On occasion of the 70th anniversary of the victory of the Liberation War of 1945 of Mongolian and Soviet soldiers, state prizes were awarded on Monday to veterans who participated in the war. Pursuant to a decree of the President of Mongolia, the Order of Sukhbaatar was bestowed upon R.Dambadarjaa and A.Dorj, veterans from Khan-Uul district's 1st khoroo (smallest administrative unit in Ulaanbaatar); U.Dorjpalam, a veteran from Sukhbaatar district's 7th khoroo; and B.Laagan, a veteran from Khan-Uul district's 11th khoroo. The Red Flag Order of Military Merit was awarded to S.Vanchigdoo, a veteran from Chingeltei district's 8th khoroo, Kh.Galjav--from Khan-Uul district's 15th khoroo; and other two veterans from Sukhbaatar and Songinokhairkhan districts. Other veterans received the Red Flag Order of Labor Merit, the Order of Military Merit and the Polar Star Order. August 31 (Asian Legal Business) Shearman & Sterling, Ince & Co. and White & Case are representing a consortium involved in the development of the $1.5 billion CHP5 independent power producer (IPP) project, the first coal-fired IPP project in Mongolia. The consortium, which is made up of GDF Suez, POSCO Energy, Sojitz Corporation and Newcom, will build a greenfield coal-fired combined heat and power plant that is expected to have a heat capacity up to 587MWt and an electrical capacity of up to 450MWe. Shearman & Sterling's Singapore project development and finance team is handling the project, led by partner Bill McCormack. CHP5 IPP is the first IPP project under Mongolia's PPP program and will be internationally financed on a limited-recourse basis. It has also been "fast-tracked" as Ulaanbaatar's heat and power shortage escalates. August 31 (Mongol Messenger) On August 31, exploration licenses will be issued in the eastern part of the country by restarting the online delivery of registration numbers. A total of 11.94 million ha of land located east of the 104th longitude is available for exploration licenses. In order to submit an application for exploration licenses, companies should first get their registration number online using VPN equipment. Although the Mining authority started the delivery of registration numbers on August 24, the login access server locked up during the online registration process and the registration process was stopped. "Registration started at 9:00 am normally and 51 companies registered, but at 9:02 am the login server locked-up and the failure lasted for 34 minutes. A working group met immediately and made a preliminary conclusion that the system failure occurred due to unexpected heavy overloading. Over 900 organizations applied simultaneously. Even though first checks at the National Data Center showed there was no attempt to get a registration number improperly, we addressed the General Intelligence Office and its Department of Cyber safety to check whether there was any illicit action. All data sent by companies are secure. We are trying to make the system operational before August 31 and necessary extensions and repairs will be made to the system. We cancelled the registration numbers given to the 51 companies as the order queue might have gotten lost", said D.Uuriintuya, head of the Mining Authority. According to the Mining authority 873 companies out of 1138 that were registered in MA bought VPN equipment to participate in applying for exploration licenses. A virtual private network (VPN) is a method for the extension of a private network across a public network, such as the Internet. It enables users to send and receive data across shared or public networks as if their computing devices were directly connected to the private network, and thus benefit from the functionality, security and management policies of the private network. Last July, Parliament passed an amendment to the Minerals law, putting an end to a four year moratorium on new exploration licenses, and in July 2014, the Government defined the areas for new exploration licenses by coordination. According to a Government resolution, exploration licenses will be issued on 31 million ha. There are 10.15 ha of licensed areas (13.39 percent) where a geological survey was conducted at the expense of the State Budget or returned licenses that will be granted through tender, while the remaining 20.9 million ha of area (6.49 percent) will be issued through application. Applications for exploration licenses started to be submitted online on January 26 of this year. In the first stage, exploration licenses have been issued for areas located west of longitude 104 since then. In this part a total of 9 million ha field will be licensed and companies asked for licenses on 6.35 million ha or 70.5 percent through applications. Around 500 exploration licenses have been issued and1.95 million ha of area is left for exploration licenses in the west. August 31 (Mongolian Economy) This woman's name is D.Tsagaanchuluun. She has been engaged in bee farming for about 30 years, and now she is the head of the apiculture (beekeeping) women's union of Shaamar soum in Selenge province. She is participating in the "National Staple Products2015" exhibition organised by the Ministry of Industry along with her other bee farmers from her province. The soum's beekeepers are participating in the exhibition for small- and medium-sized enterprises held in Ulaanbaatar for the sixth year. They have discounted their honey by 10 percent of for this exhibition. The usual price of one kilogram honey is MNT 22-25,000, but at this exhibition, it was sold for MNT 20,000. "Our soum's beekeepers harvested 72 tonnes of honey last year. This year we are expecting 40 tonnes, since our province had quite a drought," said D.Tsagaanchuluun.In this single town, 117 households are engaged in beekeeping, accounting for the 60 percent of the country's apiculture industry. More than 80 enterprises representing 21 provinces and capital city's SMEs participated in this exhibition held at Chinggis Square. Delger Mungun Dalai LLC, which operates in Khovsgol province, is participating in each exhibition organised in Ulaanbaatar since June. "In general, any exhibition becomes a real promotion for our products," said G.Ganchimeg, the company's sales manager in Ulaanbaatar. They produce tea, soda and salt in their province, and are aiming to establish a branch in the capital. Every province has its own staple products. G.Bilguun, Head of the Small and Medium Sized Enterprises Policy Coordination Department at the Ministry of Industry, noted that this exhibition is being organised in order to introduce such domestic products. The exhibition's goal is to implement the Ministry of Industry's policy to increase import substitutive ecologic export products and meet domestic needs with value added finished products. The exhibition was held until the 30th of August. August 31 (news.mn) Delegates from the State Great Hural (Parliament) of Mongolia headed by Chairman Zandaakhuu ENKHBOLD are attending the Fourth World Conference of Speakers of Parliament convened in New York, U.S. on August 31, 2015. In the frameworks, Chairman Z.Enkhbold held a meeting with Speaker of the House of Representatives of Japan Mr. Tadamori Oshima on August 30, 2015. At the beginning of meeting, Speaker T.Oshima said he was very happy to meet his counterpart on the occasion of the IV World Conference of Speakers of Parliament. Furthermore, he highlighted "Mr. Enkhbold's visit to Japan conducted last February was very fruitful to broaden bilateral relations and cooperation, where the parliamentary groups of the two legislative powers have been playing a significant role becoming a bridge. In July 2015, Japanese representatives have participated in the commemoration of the 25th anniversary of Mongolia's democratic revolution. Nevertheless, Japan gives a high priority to the current developing strategic partnership and believe to further expansion of relations between the two countries". Chairman of the Parliament of Mongolia Z.Enkhbold responded that he was glad to meet him on the eve of the IV Conference and further said, "One of the priorities of Mongolia's foreign policy is to deepen cooperation and to maintain good ties with Japan as considered Mongolia's third neighbor, besides, our country gives a high priority to the current developing strategic partnership relations. In recent years, bilateral collaboration and relationship as well as mutual trust have been broadened and strengthened. The Economic Partnership Agreement (EPA) established between the two states is very important to bring cooperation into a newer level. I would like to thank the Prime Minster of Japan Mr. Shinzo Abe on proposing and carrying out his 'Dynamic' initiative to level-up bilateral economic cooperation. Mongolia is seeking to introduce Japanese investment and know-how based on the signed EPA and further to supply Japan and the third market with goods made in Mongolia that would open an opportunity to join a regional manufacturing network and economic relationships". At the meeting, members of the State Great Hural S.Batbold and Ts.Oyungerel, Permanent Representative of Mongolia to the United Nations, Ambassador S.Sukhbold and other officials from both sides were present. Ulaanbaatar, August 31 /MONTSAME/ Representing the government of Mongolia, a member of parliament M.Batchimeg and the Minister of Population Development and Social Welfare S.Erdene MP participated in the World Assembly for Women (WAW) held August 28-29 in Tokyo, Japan. The WAW Tokyo was held for the second time by an initiative of the Prime Minister of Japan under a policy "A Society where Women Shine", continue to be one of the priority issues of Abe Administration. Our delegation has held a meeting with Mr Shinzo Abe, the Premier of Japan, and then delivered speeches at sub-meetings of the Assembly. This Assembly brought together some 150 leader women such as Ms Phumzile Mlambo-Ngcuka, the Under-Secretary-General and the Executive Director of UN Women; Ms Helen Clark, the Administrator of the United Nations Development Programme; Ms Ellen Johnson Sirleaf, the President of Liberia and Nobel Prize laureate. August 28 (president.mn) On August 26-28, Ulaanbaatar, capital of Mongolia, hosted the Twentieth Annual Meeting and Biennial Conference of the Asia Pacific Forum of National Human Rights Institutions. President of Mongolia Tsakhiagiin Elbegdorj delivered a speech at the Opening of the Forum. "I extend my greetings to the ladies and gentlemen who have assembled today in this venue. It is a matter of honor for Mongolia to host the Asia Pacific Forum of National Human Rights Institutions. Asia and the Pacific is a big region. And human rights is the most important topic, I think. I am profoundly happy to welcome and meet with you, the distinguished guardians of human rights across this big region, Asia and the Pacific. Once an eminent Mongolian poet said that the best of the professions is that of a teacher. Well, to me, the most respectable and the most responsible profession is the service for human rights. Of all the jobs, the most important is safeguarding human rights. It is a tough job. You often interact with the state, government, and officials who are practically "armored" with and shielded by human rights. A human being must work for his human rights. Yet, working for others' human rights is an amazing service. And when working to secure others' human rights, you deal face to face with organizations which are or are highly likely to infringe upon, violate human rights. You deal with those who arrest – the police, the detention officers, the judges, the prosecutors and other law enforcers on a daily basis. And it often may be a case when serving for others, your own freedom is restricted; your own rights are disregarded and pressurized. Mongolia is a unique country in our region. In this hall, there may be ones who were coerced or intimidated for speaking for and defending human rights. There could also be topics which are avoided, kept silent. Please feel free to speak up in Mongolia. Talk freely about what worries you, what challenges you. In Mongolia for speaking your mind no one will cause you any problem, any discomfort. Therefore, please enjoy freedom in Mongolia. Please be free and brave to advance your mission for human rights in Mongolia. Mongolia's path toward success in human rights wasn't easy. And perhaps, it won't be easy in the future as well. Even today we are facing tough challenges and difficulties. In our Constitution we enshrined the most important declarations and provisions on human rights. We are also working to revise and amend Mongolian laws to conform to the Constitution. Mongolia is a signatory to the important treaties, conventions, agreements and protocols issued by the UN. We abide by these laws equally diligently as we abide by our national laws. Understanding the history of biogeographic connections between Asia and North America provides a critical foundation for studies of biodiversity and human health. Over the past three decades we have built natural history specimen collections of mammals and associated parasites from Canada, Alaska, Siberia and Mongolia that provide a powerful basis for a number of scientific studies. Because our planet is changing rapidly, natural history specimens are now essential baselines for the study of changing conditions. Each specimen provides a baseline sample because it represents a unique individual and species at a particular place (spatial) and time (temporal). These samples are necessary for understanding changing environments, especially when scientists use new technologies (GIS, stable isotopes, genomic analyses) to explore the fields of biodiversity discovery, biogeography, genomics, morphology, ecology, vector biology, and emerging zoonotic pathogens. Support for ensuring preservation of records generated in various research efforts should be a national priority for Mongolia. In the near future, we need to work together to help build a development plan for natural history collections for Mongolia (including training the next generation of Mongolian biologists) so that Mongolians will continue to benefit from the distinctive, long-term contributions of natural history museums. Developing this infrastructure depends on broader engagement and support from across scientific, educational, business, and international communities, and is both an ethical and scientific imperative given the rapidly changing environmental conditions on our planet. August 31 (news.mn) Sportsmen of the National Emergency Management Agency (NEMA) Firefighting and Rescue Team have left for Russia, in order to participate in the 11th World Championship of Fire and Rescue Sport. This will be the fourth time NEMA is participating. The World Championship will be held from 1st to 10th September in St Petersburg and will involve approximately 20 countries including: Russia, Austria, Belarus, Czech, South Korea, Ukraine, Latvia, and Turkey. August 31 (infomongolia.com) The World Judo Championship 2015 has concluded with team competition on August 30, 2015. Mongolian men's team matched with judokas of Cuba, Georgia and Tunisia in pool D, and defeated mighty Cuba by 5:0 and later all opponents in the pool. In the semi-final, our team lost to South Korean judokas by 3:2 and for the bronze medal match Mongolian team competed with judokas of hosting country of World Judo Championship 2015, Kazakhstan and won by 4:1. It is the first bronze medal for the Mongolian men judoka team in team competition category of World Championship. Thus Mongolia has captured four bronze medals from World Judo Championships 2015 in Astana. Ulaanbaatar, August 31 (MONTSAME) A State Honored Sportsman D.Baatarjav has been qualified to compete in the 2016 Rio De Janeiro Paralympic Games. Our archer got the right for Paralympic Games during his successful competition at the 2015 World Archery Para Championships held August 23-30 in Donaueschingen, Germany. He took 9th place in the men's open recurve contest. He has beaten his opponents of Malaysia and South Korea. Baatarjav Dambadondog won Mongolia's first-ever medal and first-ever gold medal in the Paralympic Games by winning the men's individual recurve standing event at the 2008 Beijing Paralympic Games.